The last year has, for obvious reasons, taken a lot out of us and that is not taking in to account the training load, so by way of a little get-away before the run up to the marathon, last weekend saw Alison and I along with lovely friends Claire and Sarah spending 3 days on the Island of Lundy in the Bristol channel. Sat 12 miles off the Devon coast, owned by the National Trust and managed on their behalf by the Landmark Trust, Lundy certainly lived up to expectations as an unplugged, way-off-the-grid, beautiful, remarkable and very peaceful refuge and with a huge chunk of luck, the weather was the best it had been so far this year. The island's supply ship, the MS Oldenberg, does not sail until March and the only way on to and off of the island is by twice-weekly helicopter. That bit is obviously awesome but the 10kg per person luggage allowance was a real exercise in packing efficiency, especially when you have all your running kit to consider. For this experience however, I would have quite frankly gone in my underwear and coincidentally, during the flight back, the high winds caused enough buffeting that Alison almost did go in her underwear. If you like your nature isolated, cliffy and rugged then Lundy is a jaw-dropping treasure. It is surrounded by breathtaking (quite literally) cliffs, and holds more history, habitats, archaeology, wrecks, flora, fauna, and vistas than your monkey-brain can absorb. While we were there, it also was home to a constant 20-30mph wind. There is one 'road' on the island which stretches the length of it, but you would not want to try driving on it unless you had an amphibious vehicle, not that you could anyway because only farm vehicles are allowed. There are instead a number of 'paths' of flattened grass which circumnavigate and criss-cross the isle but as these have been made not just by people but also by Lundy goats and Soay sheep at any moment they can disappear off of a cliff, in to an open-topped sea cave featuring a 400ft drop to the sea or into a shoe-sucking marsh. 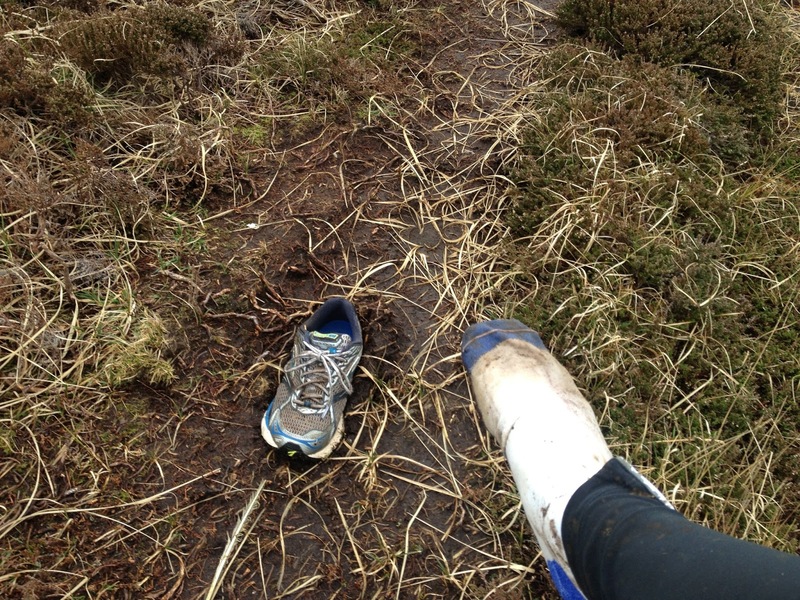 All said, I set off for my 8-mile tempo run on Saturday and within a mile realised that to run to a set pace here would have been an exercise in futility and so I reset my watch and went for my first ever off-road fun run and it was all rather fabulous. I laughed out loud and whooped several times with exuberance and excitement as I leapt from rocks, ran past light houses, sprung along tracks which four feet to my left changed magically to thin air, avoided belligerent Soays and for a good 300m sprung between tufts of grass to traverse a rather moist marshland. 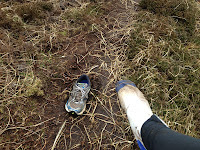 Not surprisingly, I met Alison and Claire mid way through their run during which Claire had managed to fall over in the mire no less than 3 times (see if you can see the encrusted mud). Chapeaux Claire! Claire is running Bath Half on March 3rd and in doing so has really kindly raised money for Diabetes UK under the TEAM! banner and for that we are amazingly grateful - GO CLAIRE! (it is less swampy, Bath). 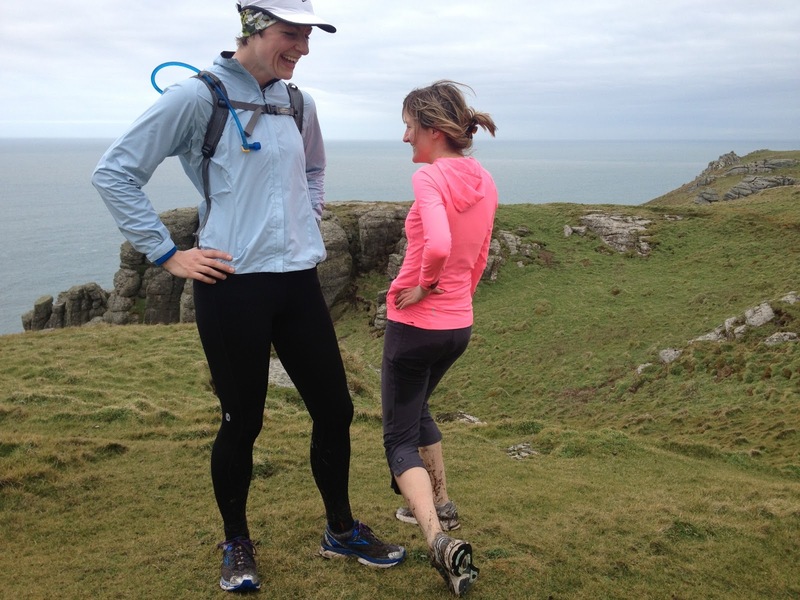 If I could run on Lundy for every interval run I would be there in a shot. It was sensational and it opened up a whole new world of running. On the island, the power is provided by three Cummins B and C series diesel generators (that is why I have a beard) and they are turned off at midnight to be restarted at 6am. While this was initially odd and in a weird sense disquieting, it quickly became the norm and I was only caught out once reading my book in bed. Although there were storage heaters, by far the most effective heat came from a coal fire stove in the lounge and as we were in a 13th Century stone building, it was a quick lesson in not letting it go out overnight otherwise the place got somewhat fresh first thing in the morning. 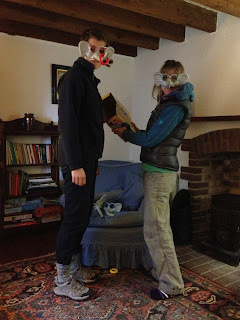 With little mobile reception and mercifully no televisions we spent much time walking and reading but when this was just not enough, people resorted to some extreme measures. Ladies and Gentlemen, I give you Doh Nutters. Quite how three adult women can spend so long working out how to pick up plastic rings using elephant masks is a mystery, but they did. The picture also allows you to see why the Great Lundy Bank Heist failed. Challenge 4 - Lundy 'Letterboxing': How Has No-one Died? Lundy Letterboxing in case you do not know is the same as geocaching which if you still don't know is finding hidden Tupperware boxes in the countryside. While it is a fantastic way to see the whole island, the staff have certainly made sure that you see bits of it you would otherwise miss by cunningly hiding the boxes half way down cliff faces. It was fun but utterly, utterly bonkers. As you may well be aware, I do suffer wonderfully from Acrophobia at the best of times but it was quite alarming how quickly even I acclimatised to this new game of Russian-cliff-roulette. It all came to a head when Claire in a moment of outer-body clarity, looked around and saw the four of us wandering around half-way down a cliff, 400ft over some rocks and the booming Atlantic in a 25mph wind, looking for a small box in a bag under a rock which given the vagueness of the clue and directions may or may not have been there. Letterboxing has been on Lundy for 30 years and the fact that no one has fallen in to the ocean is testament to something, I am just not quite sure what. I went home to wrap my head in cotton wool, and Claire and Alison went off with 'Soay' Sarah who now had blood-lust for the game. Great run, tremendous weekend and if you get the opportunity, go to Lundy. But not all at once as you won't fit.